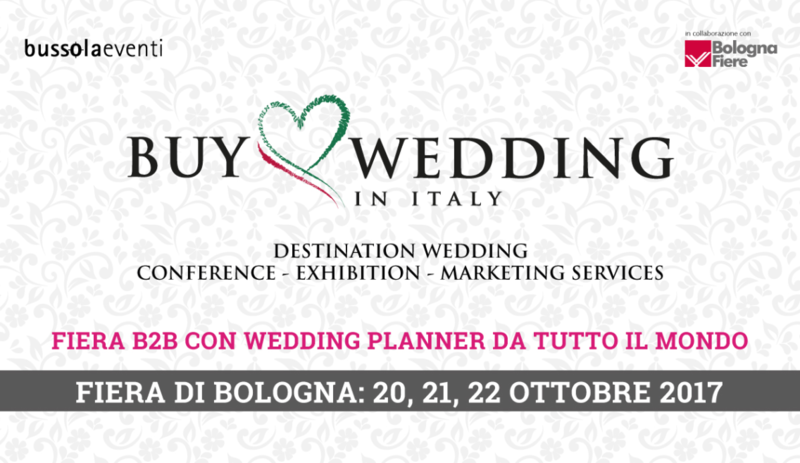 Are you organising your Italian Wedding? 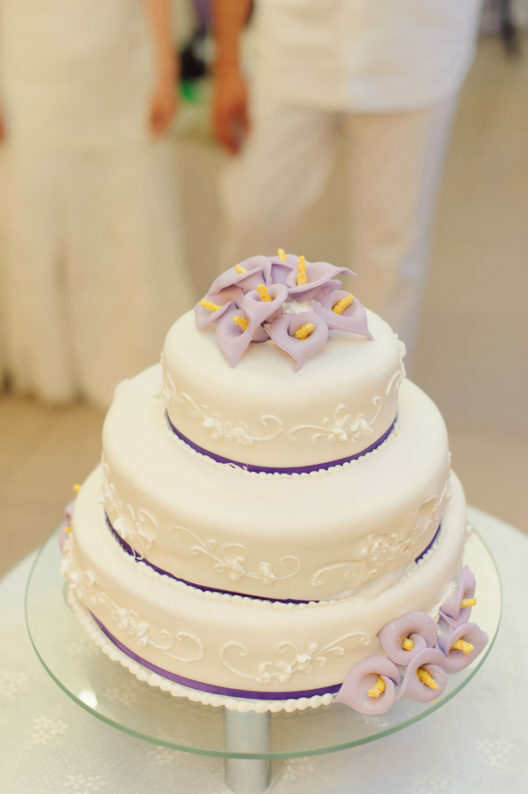 Are you organising your Italian Wedding? Here is an embarassment of riches, you just have to choose! Stylish, classy, cool…this is Matteo Brancaleoni, the one and only “Italian Crooner”. Considered nationally and internationally one of the leading interpreters of Italian and American Songbook, often compared to Frank Sinatra, he is simply the best of the living swing and jazz tradition in Italy. His albums have reached four times the n.1 position on the iTunes Jazz Charts. He has performed alongside artists like Michael Bublé, Fiorello, Renzo Arbore. Over the years he has performed more than 500 concerts around the world in the most prestigious venues and top locations. 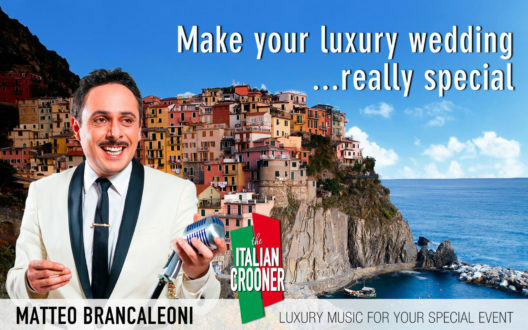 Matteo Brancaleoni, the Italian Crooner, is the touch of class for your private event. Oasi di Kufra - where style meets the sea. Forget the stress, forget all your worries when you arrive in Oasi di Kufra Hotel. Nothing is too much trouble, the location is ridiculously beautiful and the food incredible. What more could you wish for? A perfect way to start married life. You can trust that you’ll be in good hands here for a wedding, honeymoon or just because.The Hotel Wedding Planner and the staff will become your most valuable collaborator, combining their expert knowledge with your personal touch, in creating the wedding reception of your dream. 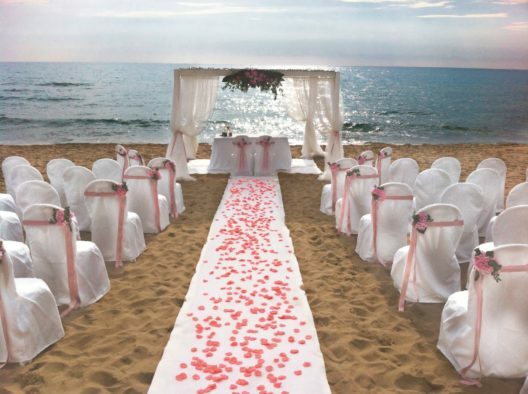 Is there anything more romantic than a wedding on an island? If you are looking for a lavish reception or an intimate exchanging of vows on the beach than look no further: Eolie in Love will be on hand to help organise your dream wedding in a truly enchanting location of the Aeolian Islands. 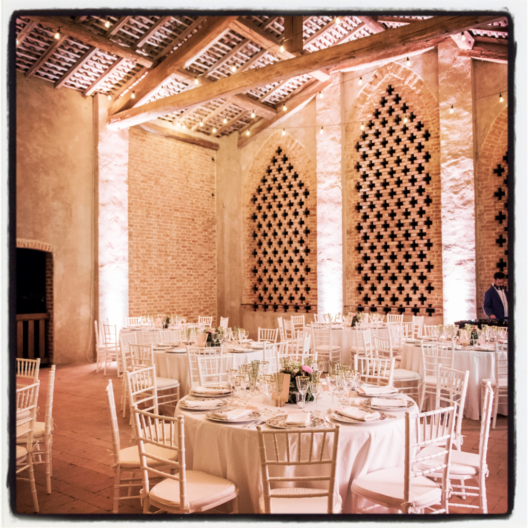 We will make sure that every aspect is unique to you for your dream day, supporting you with care and attention to every detail, from the location and catering to the paperwork for the marriage, wedding favours, flower arrangement and wedding cake. You can rest assured that your dreams will come true! 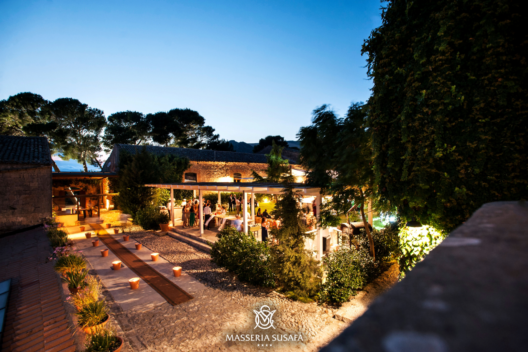 The Masseria Susafa, owned by the Saeli-Rizzuto family, is the perfect location for your wonderful day.The Masseria will welcome your guests in a striking setting where time seems to have stood still, and delight with tasty, local gastronomy. The recipes are the result of the meticulous pursuit for new interpretations of traditional dishes, which are creatively reproduced by the chefs who are able to customize the menus with care and experience.The Masseria offers the possibility to stay over with 14 comfortable rooms.The hospitality and elegance offered by the venue, the enchanting natural setting in which it is immersed, combined with the great staff, make the Masseria Susafa the ideal location to celebrate your most important occasions. The couple will be able to count on the collaboration, versatility and professionalism of the staff. 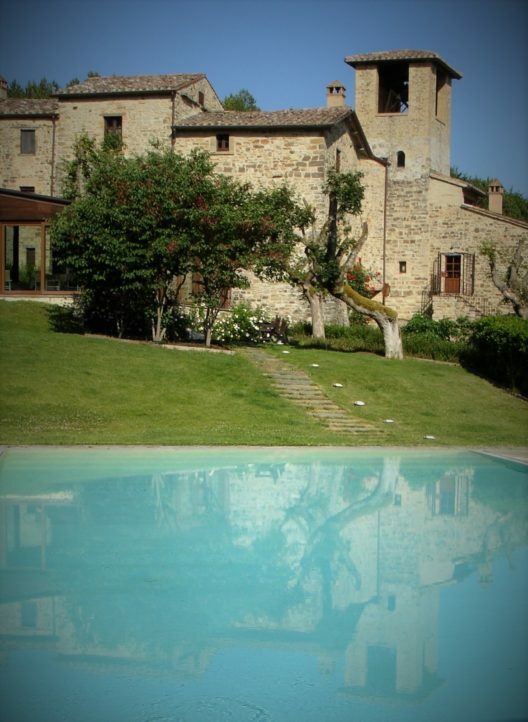 Abbazia San Faustino is cosily nestled in the heart of the Umbrian countryside: history, comfort, exclusiveness and breathtaking scenery are surely the perfect ingredients for that perfect day! 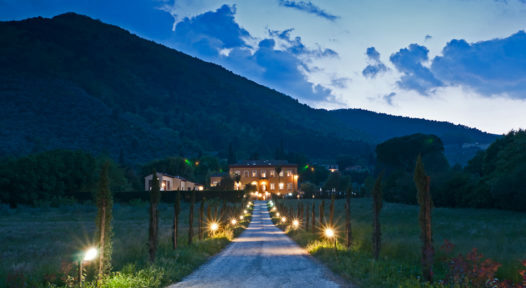 It is one of the very few private locations in Umbria where legal civil marriage ceremonies can be held. In our restaurant we select only the finest local products and these are the ingredients we put together for all our banquets. For your party you won’t have to put up with unpleasant time limits. You and your guests can dance, play music and even dive into our heated swimming pool at any hour of the night. The building borns from the renovation of an ancient manor farm that once passed to the Conti di Monserrato transformed it into a luxurious noble rural home.Today Cala dell’Arena is the right union between the past splendour and nowadays technology. Situated in front of the gulf of Macari, it is possible to admire fabulous sunsets which recall the city of Eraclea. Surrounded by the mediterranean vegetation, Cala dell’Arena offers its natural frame where to plan special events. It is possible to organize wedding banquets, wedding ceremonies, gala dinners, theme feasts, incentives and all those events that bond people together. Of special beautifulness the terrace that overlooks the pool and an overwhelming natural landscape, the gulf and its sea. A team of professionals will direct the whole event planning, up to the event day, caring accurately every single detail to create a unique effect of that day. Inside the luxurious noble house it is possible to sleep; the rooms, double or triple, all of them are elegantly furnished and possess minibar, air conditioning, safe, tv and hair drier. Cala dell’Arena’s villas are located inside of the park and are equipped with kitchen and furnished terrace. From Cala dell’Arena it’s easy to reach the most important touristic centres such as Erice, Zingaro, Egadi islands. Always I love roses and pearls a symbol of elegance and good taste. So I choice "Rose e Perle " for my agency. Rose e Perle will introduce original solutions for your wedding in the most beautiful places in Rome or Lazio. There will not be an event equal to another because each couple is different and your special day must be built according your personal tastes and preferences! 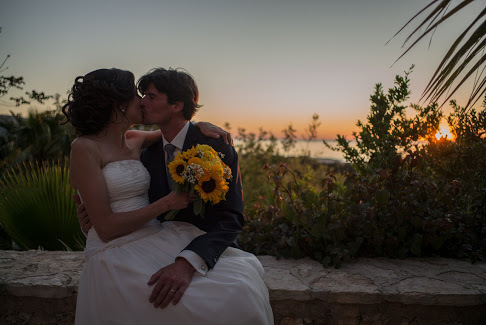 Rose e Perle will follow every stage of your wedding organization, from the very beginning to the end, figuring our which are your own dreams about your wedding and making them true.